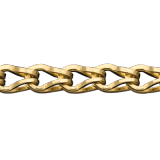 The Fish Scale Chain (or Squama Chains) is another classical production of FAOR’s fold over collection. It is produced from a sheet like all the other fold over chains that is then stamped and linked on in series, one link after the other. It can be produced in different shapes and sizes both in Gold and Silver. 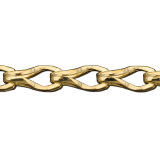 We produce Squama Chains in different sizes, from 1mm to 1.8mm, and in various metals such a Gold (9 Kt, 10 Kt, 14 Kt, 18 Kt, 21 Kt, 22 Kt) and Silver Sterling.